The millennial version of a Shepherd’s Pie. The vegan kind. Nowadays, host a dinner party for your friends and there’s bound to be a vegetarian / vegan in there somewhere. This can be instantly challenging, UNLESS you’ve got a few winning dishes under your belt. Just like this one. This recipe is pretty cheap to make, pretty basic to cook and extremely yummy to eat. 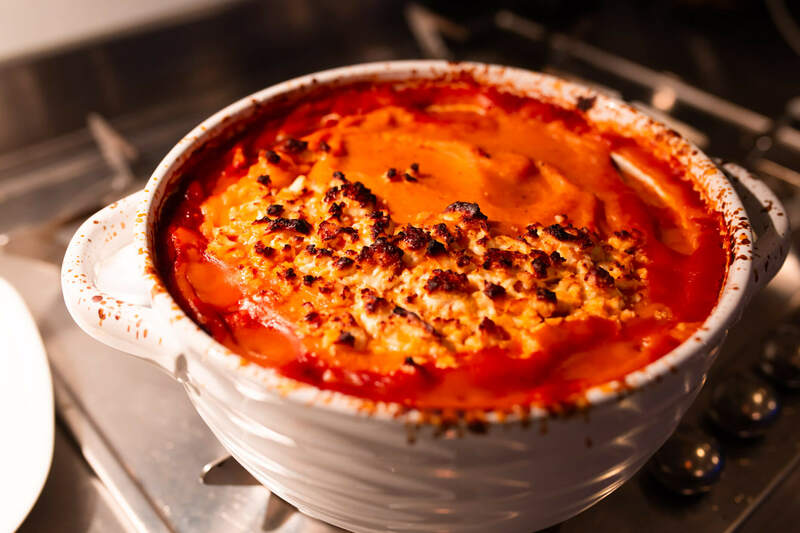 It has the desirable inner warmth and satisfaction that comes with a Shepherd’s / Cottage Pie but it will cater for all your veggie and vegan lovers! This pie is enough for 4 people to have a decent serving on it’s own or 6 people with a side of whatever you fancy, be it salad, chips or garlic bread. It takes 10 minutes to prepare and about 50 minutes to cook. Wondering what to cook for your friends at the weekend? This is it. Topping the pie with cheese is SO great. Feta if your cooking for veggies, vegan cheese for the vegans! It’s completely up to you – get creative! The vegetables are completely interchangeable. Use whatever’s in your fridge / available at the supermarket. 1. Heat your chosen oil in a pan and fry off the chopped red onion for a couple of minutes before adding in the chopped pepper, leeks, aubergine and garlic. 2. Peel and chop the sweet potato into chunks and boil in a separate pan. 2. Once the vegetable mix is just about cooked through (around 10-12 minutes), add the 3 tins of chopped tomatoes, squeeze of tomato puree, and drained lentils into the pan. 3. Reduce the tomatoey vegetable mix to a low heat and cook for about 20 minutes. 4. Once soft, remove the sweet potatoes from the heat, drain out the water and mash them by hand / pop them in a food processor. Tip: Add some butter and or almond milk to the sweet potato mash to cream up. Season to taste with salt and pepper. 5. Pop the mash to one side and check on the taste of the tomato lentil mix. Season with salt, pepper and soy sauce to taste. 6. When happy with the mix, pop the tomatoey vegetable and lentil mix into your baking dish and then top with your sweet potato mash and cheese (if you fancy). 7. Pop in the oven for 30 minutes, turning the heat up for the last 10 minutes to crisp and prepare any sides whilst you wait. What’s your favourite recipe to bake? I’d love to know your go-to recipes? So keen to be in the kitchen cooking more!